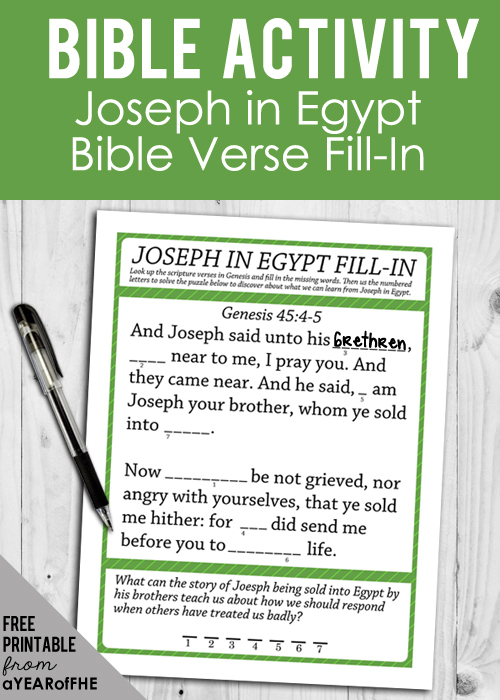 What You'll Need: scriptures, GAK 109: Joseph Is Sold by His Brothers, printed blank coat page, glue stick, child-safe scissors and scraps of construction paper, printed word fill-in and pen/pencil. Spiritual Quote: Gordon B. Hinckley "...forgiveness, with love and tolerance, accomplishes miracles that can happen in no other way." Jacob had twelve sons, but Joseph was his favorite son. Jacob gave him a beautiful coat of many colors, which made his brothers jealous and angry. One time when the brothers were out feeding the sheep, Jacob sent Joseph to see how they were doing. When the brothers saw Joseph, they planned to kill him. But his brother, Reuben, persuaded them not to. Instead, they grabbed him, tore off his colorful coat, and threw him into a pit. He was 17 years old. 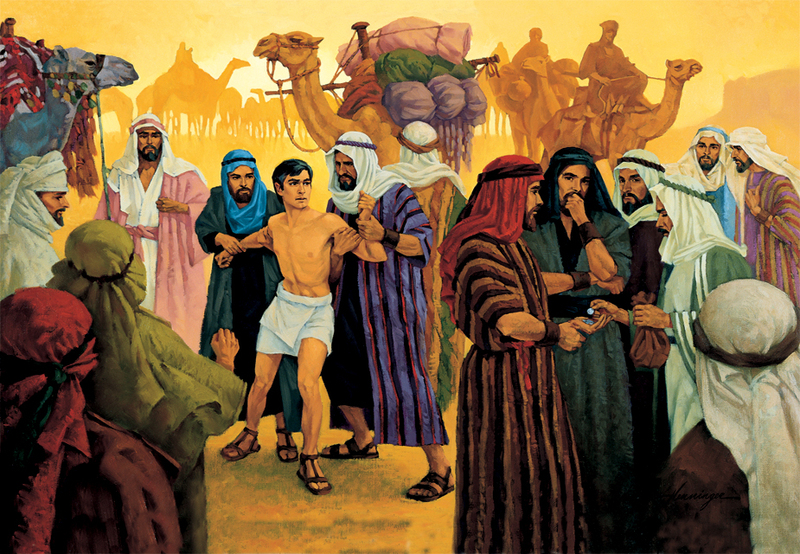 Soon some people were passing by, and the brothers sold Joseph to them. Then the brothers killed a young goat, dipped Joseph’s coat in its blood, and showed the coat to their father, hoping to convince him that a beast had killed and devoured Joseph. Joseph's father was heartbroken. The people who bought Joseph took him to Egypt. While Joseph was there people lied about him. He was thrown into jail, but he always remained faithful to the Lord. One day when Joseph was in jail the King had a dream. He asked if anyone could tell him what the dream meant. Joseph was able to tell him because Heavenly Father gave him that gift. The King let Joseph out of jail and made Joseph very powerful. Soon Joseph's brothers needed help and went to Egypt to ask for help from the King. When the brothers arrived in Egypt, they went to the house of an important man. They bowed down to him and asked him for help. None of the brothers realized they were bowing to their brother Joseph. But Joseph knew they were his brothers. “I am Joseph your brother, whom ye sold into Egypt,” he said. The brothers were speechless and frightened. Would Joseph be angry with them? Joseph forgave his brothers. He said, "Now therefore be not grieved, nor angry with yourselves, that ye sold me hither: for God did send me before you to preserve life." Moreover he kissed all his brethren, and wept upon them: and after that his brethren talked with him. Joseph’s father and brothers and their families came to live in Egypt. Joseph knew his family had been blessed by Heavenly Father. Because Joseph was faithful to the commandments and forgave his brothers, his family lived and grew and became righteous. - Do you think it would be hard to forgive your brothers if they did that to you? - How can we be more like Joseph when our families do things that make us sad or hurt our feelings? Bear your testimony about forgiveness. Because Joseph forgave his brothers he was able to help fulfill God's promise to Abraham and establish the 12 tribes of Israel. Have children color patterns onto the coat or have children cut out small pieces of construction paper. They can then glue small squares of many colors to the blank coat to create a coat of many colors. Hey I have just found your site and I'm really loving it! I was looking for a lesson on manners and I'm doing your lesson tonight with my kids. thank you so much for your blog! I'll be a frequent visitor, i'm sure. I am truly enjoying your blog. I share your passion for FHE. I too have felt frazzled trying to get family home evening ready in time for Monday. What a gift you have given us busy moms. Thank you! Thank You! Many blessings to you! 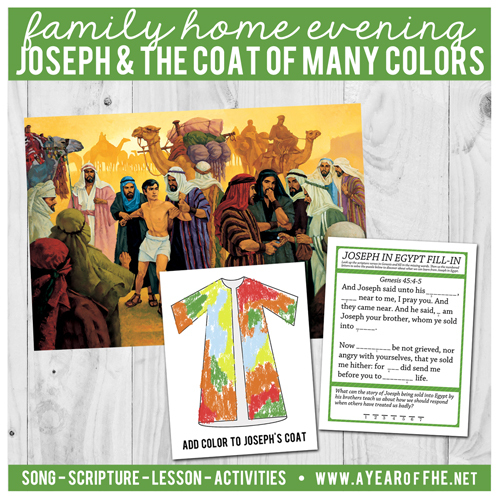 Thanks for a great lesson; it's practical and concise :) The coat will be great for a "Joseph's Coat of Many Colors" display/bulletin board with my Sunday School class! Greatly appreciated, thanks! I tried using the google doc and it just takes me to the coloring picture. I love your easy lessons and since I started using them FHE doesn't seem like a chore! !Thank you! 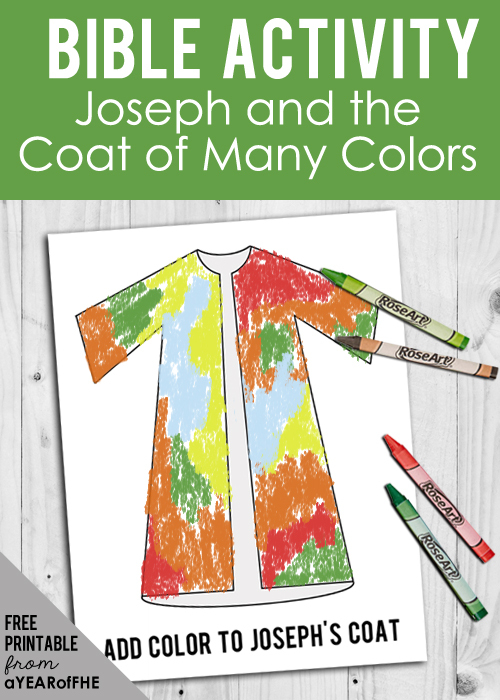 I love the idea of the blank coat, and the kids can use scrap pieces of paper to create a coat of many colors!!! My kids watched the Joseph movie on Netflix today so this went along perfectly for our FHE lesson. Thanks for the lesson and free printable! Thank you, Emilie! Using the color pages for Midweek 3-year olds. I'm thinking of printing out copies of this and having the kids glue fruit loops in different colors onto it, but I don't know if the copy is big enough. Can anyone tell me before I have them printed?? Perfect for preschoolers. THERE are so many things they can do to decorate the coat. so grateful for your talents and your willingness to share. Here's to another great lesson. Thank you!